Happy New Year! 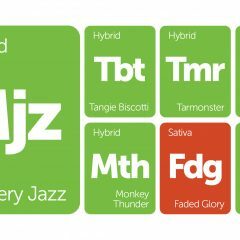 Start 2016 off right by branching out with some new strains. Here are seven that were recently added to Leafly's database, which means you're now able to rate and review them. Remember to check out the links below to see if a location near you currently has a strain stocked! Parent strains Super Silver Haze and The White were brought together to create this uplifting hybrid strain. Whiteout delivers intense euphoria paired with an alert, focused effect sure to satisfy your daytime needs. These frosty light green buds shimmer in light and will hit you with a pungent zesty lemon aroma that would be expected of a Super Silver offspring. Grape Inferno is a 70/30 indica-dominant strain bred by NorStar Genetics and propagated by TGA Genetics. A cross between Nepali OG and Querkle, Grape Inferno inherits a dense bud structure and a sweet grape aroma from which this strain gets its name. With flavorful undertones of hash and berries, Grape Inferno delivers a meditative and calming high that lets the body relax while the mind wanders. Its buds bloom in a colorful show of lavender, pink, red, and green. 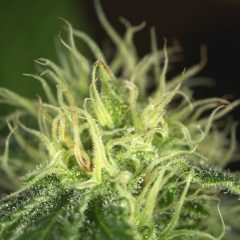 Fire Alien Kush from OG Raskal Genetics is a potent hybrid strain that crosses Alien Kush with Fire OG. Known for its heavy resin production and lofty buzz, Fire Alien Kush will send you flying through the cosmos in blissful euphoria. Some phenotypes take after Fire OG with a lemony pine aroma while others lean more towards Alien Kush, an earthy indica that provides deeply relaxing effects in the body while elevating the mood. Haleigh’s Hope is a high-CBD strain from Colorado named after a 4-year old with cerebral palsy and epilepsy. Her conditions were treated with an oil derived from this strain, which exhibits a CBD:THC ratio of 24:1. This low-THC, high-CBD cannabinoid profile was finally achieved after four years of crossing and selecting from hundreds of different phenotypes.